The No NRA Money campaign, run by Florida-based LGBTQ group Equality Florida, is working alongside Parkland students for gun reform. NEW YORK: Online campaign No NRA Money got a viral push last month when a student from Marjory Stoneman Douglas High School retweeted its call to action. Since then, the campaign has benefitted from heightened media and public attention and has had more than 270 politicians sign its pledge to not accept funding from the National Rifle Association. The campaign was started days after the February 14 Parkland, Florida, shooting by LGBTQ group Equality Florida and Pulse nightclub shooting survivor Brandon Wolf. It quickly became connected with similar efforts by Parkland students rallying against the National Rifle Association. Shortly after the campaign went viral, No NRA Money brought on Target Cue principal Cathy Renna for comms support. 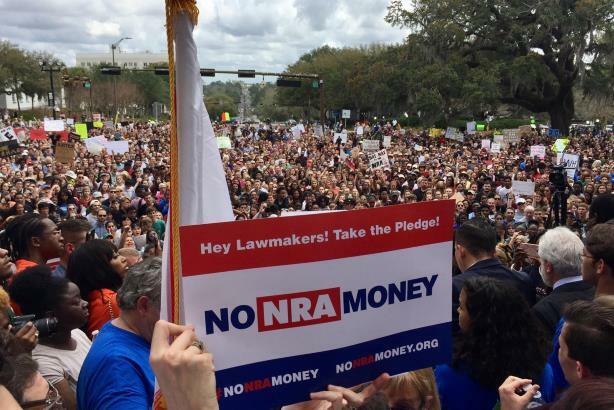 "The No NRA Money campaign became very linked with the [Parkland students’] Never Again campaign," Renna said. "We’re trying to provide as much support and amplification as we can for the students that are doing this. [Parkland student and survivor] David Hogg agreed to be a voice for NoNRAMoney.org. Those are the voices we’re trying to get out there. This is about the survivors’ voices, not about the activists’ voices, although the survivors are very much activists in their own right." The campaign aims to secure pledges from politicians and political candidates that they will not accept donations from the NRA. In addition to promises from more than 270 politicos, the campaign is also encouraging voters to pledge not to vote for a candidate who takes money from the NRA. A major focus of the campaign is education. No NRA Money is calling out politicians who have accepted NRA funding and encouraging voters to research their representatives’ and candidates’ campaign donations. That education is being done on social media and through media relations. Media entities such as CNN.com and Morning Joy have done stories about No NRA Money. "For the No NRA Money campaign, there will be a continued effort to get more politicians to sign the pledge and to get the public engaged," Renna said. "We’re trying to educate the public about NRA funding and that has been a big thing. We’re saying that taking money from NRA puts you in the pocket of this organization." Renna also worked with Equality Florida on gun control issues after the Pulse nightclub shooting in Orlando in 2016. However, she said the feeling among gun control activists is different this time around, and predicted it will build following Wednesday’s national school walkout and the March for Our Lives on March 24. "We needed a bunch of teenagers to come along and set us straight," Renna said. "They were taught about getting your message out there and using media as tool to educate and advocate for change."